Portable Magnetic Gun Rack For use with UNLOADED gun only! Like an extra hand (but much smaller than your fist), the MAGnet Gun Caddy conveniently secures your gun when you need to temporarily set it down or store it. Unlike other racks where your guns are just leaning, the patented MAGnet Gun Caddy actively holds the gun barrel making it a safer, more secure way to rest your gun. It's small enough to fit in your vest pocket (about a 2 inch cube weighing only 2.2 ounces), it holds just about any gun upright against your vehicle, gun safe, or any surface with metal. The compact, light weight, single gun design, makes it truly portable. The modular design provides maximum flexibility for placement - whether to insure safe space between firearms and individuals in the field, or for outfitting your gun locker, you'll have the freedom to set the height and or space in between your firearms that you want. The MGC utilizes the strongest soft (rubber) Magnet that can be manufactured. It's 1/4" thick with dual poles in both directions. Which means it's going to hold strong to the metal surface, and also resist sliding. To learn more about the strength and why we use a rubber magnet click here. For a quick visual on the holding power, watch this Tilt Demo Video. How many portable magnet gun racks can you do that with? Answer: One, The MAGnet Gun Caddy. Why is that important? Racks that you just lean your gun into are susceptible to accidents too. 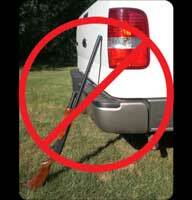 A simple bump, or someone getting in or out of the vehicle - even the slamming of a door can jolt a gun out of a rack that does not secure the barrel. With the MGC's soft high-energy magnet, it's the only portable magnetic gun rack that actually secures (holds) the barrel of your gun (it's not just another place to "lean" your gun) and the US Patent Office agrees with us. The MAGnet Gun Caddy protects your gun and your car and is small enough to fit in your pocket - making it truly portable and easy to store. It's A SMARTER WAY TO REST YOUR GUN ! The small light weight modular design makes it possible to use with a single gun - providing safe space between firearms and individuals. Of course you can also line up as many as you need or want to save space in a gun locker. And of course you can put them at varying heights - because as you know not all guns are the same length. The MGC provides maximum flexibility. Our customers have found that using the MAGnet Gun Caddy on the outside of their gun safe is also very handy. Now they have a place to stage their gun while opening and closing the safe! It works with shotguns, rifles, side by side or over/under double barrel, just about any long barrel firearm. The MAGnet Gun Caddy is designed to provide a handy place to rest, secure, and protect your gun and your car. 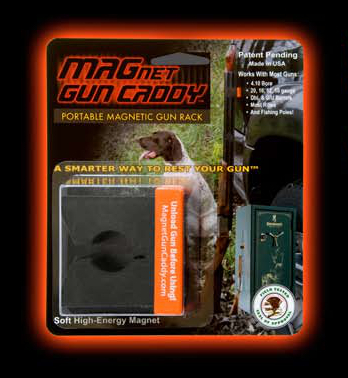 Whether you are getting ready to begin your hunt, just taking a break to water your dogs, or returning from a rewarding experience in the field, the MAGnet Gun Caddy provides a fast and convenient way to rest your gun. Remember, NEVER use the Magnet Gun Caddy with a loaded gun. Next to our dogs, our guns and cars are our most important (and expensive) hunting assets. For less than $20 you can protect both! The MAGnet Gun Caddy is so affordable you may as well purchase a few extra for when your hunting buddies are riding in your car. You'll gain additional peace of mind knowing their guns (and your car) are safely secured. It’s a smart investment. Plus you and your friends will all benefit from the convenience, and maybe even enjoy, a little more, the sport we all love. Now you can safely rest your gun and share your stories as you reminisce about the hunt. Don’t miss this opportunity to be part of the camaraderie. Look for the MAGnet Gun Caddy at your favorite sporting goods store, or use the Where to Buy menu to locate a store near you. Friends will ask, "Where did you get that?"